This 2-LP set celebrates one of the greatest and most ambitious projects in the history of sound recording. Back in the late 1950s, the 'Mercury 1812' became the definitive test record for audio equipment manufacturers demonstrating their latest loudspeakers, cartridges and amplifiers at audio shows around the USA. This 2-LP set celebrates the label�s resounding achievement by combining Dorati�s two 1812 recordings for Mercury � in mono from 1954 and in stereo from 1958. In 1954, Mercury embarked on one of the most ambitious projects ever undertaken by a classical label. 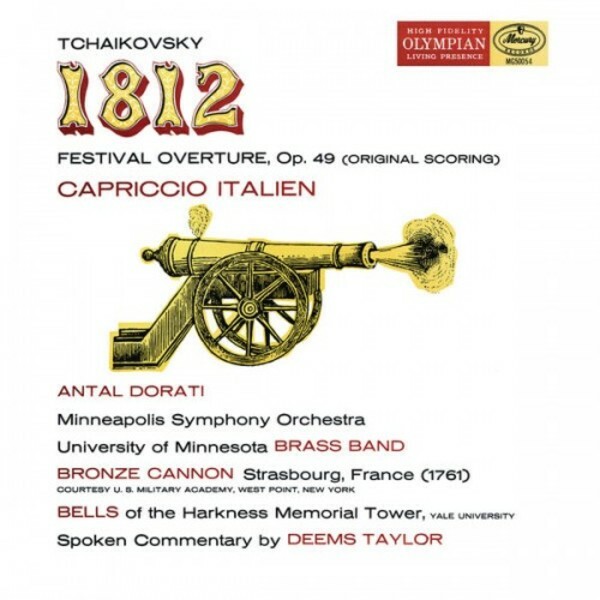 It set about recording Tchaikovsky's 1812 Overture, using the original score for symphony orchestra augmented by church bells, cannon and brass choir. The work was recorded in three different locations. The musical score was taped by the Minneapolis Symphony conducted by Antal Dorati in Northrop Auditorium; the pealing of Kremlin bells was re-created by the bells of the Harkness Memorial Tower on the campus of Yale University; and an authentic Napoleon-era (1761) cannon was recorded at the U.S. Military Academy at West Point. The final 'effects' tapes of cannon and bells were then played in synchronization with the edited musical performance to produce the master tape. The landmark recording resounded throughout the recording world, further consolidating Mercury's position among audiophiles and the general record-buying public. For several years, the 'Mercury 1812' became the definitive test record for audio equipment manufacturers demonstrating their latest loudspeakers, cartridges and amplifiers at audio shows around the country. Even The New Yorker published a story headlined "Boom!" on the making of this recording. In 1958, Mercury re-recorded the 1812 Overture in stereo with the same musical forces, but with the bells of the Laura Spelman Rockefeller Memorial Carillon at the Riverside Church in New York City and a 12-pound, Napoleon-era (1775), bronze siege cannon (made in Douai, France and inscribed Le Constant), again from West Point.